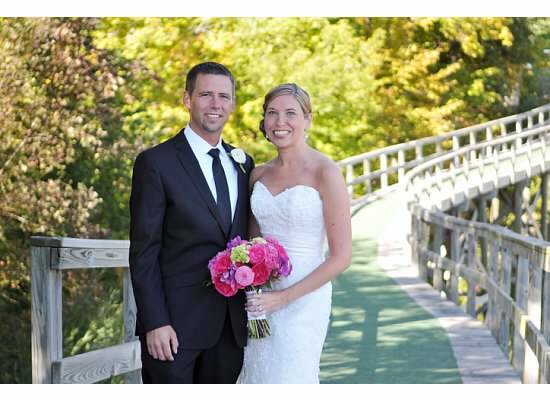 Alison and Matt were married last fall in Illinois at the TPC Deere Run Golf Course. 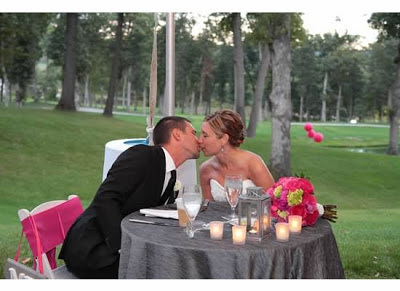 They had an outdoor ceremony on the grass, followed by a tented reception. The bridal party was decked out in Alfred Sung dresses and mens accessories. 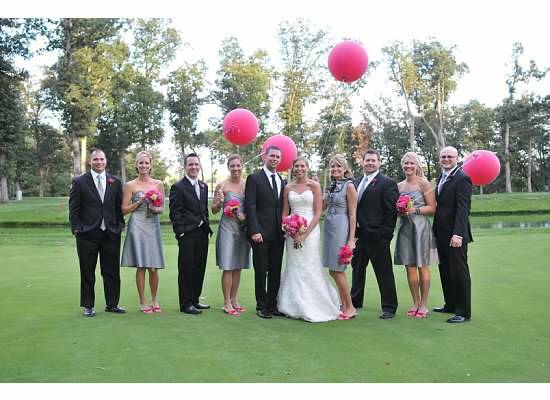 Alison loved the way the Quarry color looked against the green grass of the golf course. My four bridesmaids loved the dresses and the ease of being able to order online themselves! Since each of my bridesmaids live in a different city and my maid of honor in another state, ordering online was the best option for us. 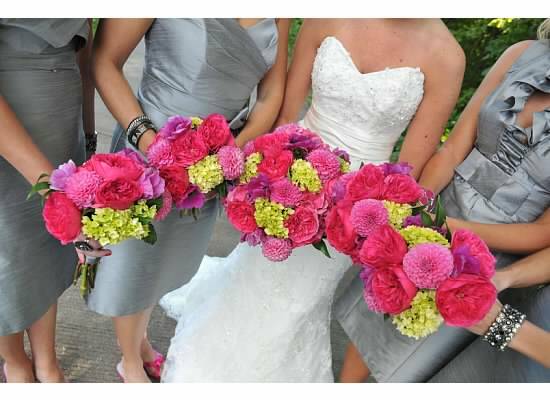 It was nice as a bride to have the personal emails from Joielle (Tammy and Julie) that made me feel important. We also ordered the ties for the groomsmen in the same fabric and color as the dresses for part of the gifts! The ties matched perfectly and they will all be able to wear them again. I have received so many compliments on the wedding party attire and have recommended Joielle to many other friends. Alfred Sung Styles D472, D512 (discontinued), D461 and D445. Alison's favorite and most vivid memory of the whole day was the couple's first look photos. 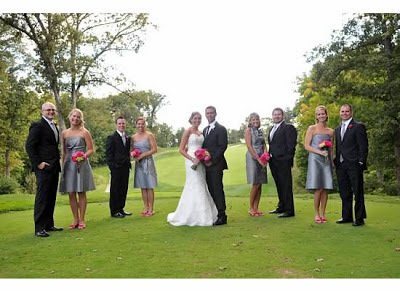 They were taken around in a golf cart with the photographer and captured different shots in different settings all over the course. They were excited and felt like a married couple even though they hadn't actually had the ceremony yet. 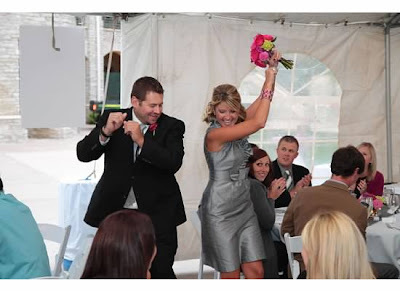 It helped Alison calm her nerves before getting in front of all their guests! 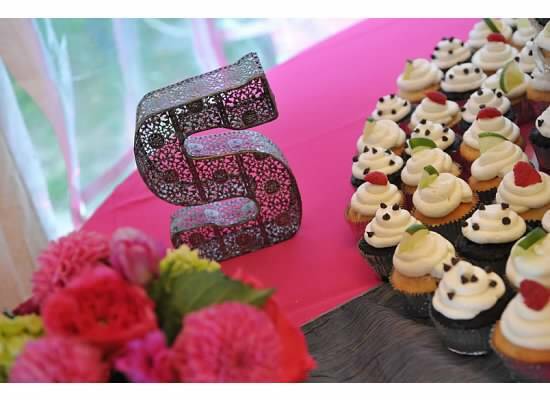 They also really enjoyed picking out the cupcake flavors, taste testing delicious options from their baker, Heller Cakes. They chose 3 flavors: White cake with raspberry filling, chocolate fudge and margarita cake. Just writing that makes my mouth water! 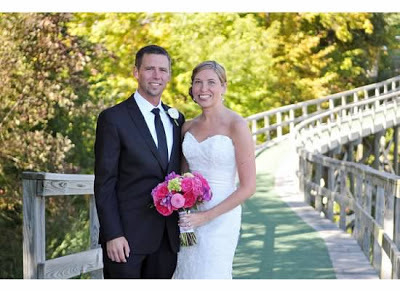 Congrats Alison and Matt! We hope married life has and continues to be sweet!